That moment when all logic goes out the window, and there is nothing but losing it. You can't rationalize your way out of it. You ride out the storm, try to contain the damage, and hope everyone makes it through. Yelling, throwing, crying. Both of my girls have plenty of them. One moment it seems like everyone is coping just fine, the next you are dealing with a screaming, thrashing toddler. But here's a little secret. It's not just the toddlers. Yup, moms have meltdowns too. It's no secret that I've become a huge fan of blogger anthologies. I love to read, I love to relate, and the stories in these anthologies are real stories from real moms. Crystal from MommiFried contacted me a few weeks ago and asked me if her new anthology could make a stop at my blog during the online book tour. That's right. A book about what happens when the moms lose it. When mom is pushed to her breaking point and throws a good old fashioned hissy fit. She snaps, and no one is safe when her ability to take a deep breath and hold her tongue has gone. Are asked how far along you are....when the baby is 3 months old? Step outside to find your son has been amusing himself by breaking glass....then when you call him on it, locking you out of the house? Are trying to manage wearing your toddler on the subway, only to have a stranger comment on what you're doing wrong? But they can be laughed at. I laughed until I cried, because I can so relate. I've had them. I've melted. I've lost it, we've all survived. I'm so thankful to read a book where moms share the moments that they look back on and cringe, and let the rest of us know that those stories happen to everyone. No, these aren't any of these mom's proudest moments. But they own them. They can laugh at them. And I love them for that. If you are a mom, have a mom, or know a mom, one who needs to know that the veneer of perfection has dropped for everyone at some point, it's worth a read. 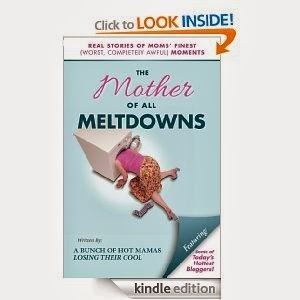 You can find The Mother of All Meltdowns on Amazon for Kindle or in paperback, or on Barnes and Noble for Nook. Bring it to Thanksgiving dinner....and maybe, just maybe, there won't be any meltdowns that day. Crystal provided me with a Kindle copy of the book in exchange for my hospitality on her book tour. All opinions are, of course, my own.